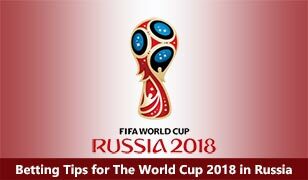 World Cup 2018 will be a great betting opportunity to place our bet and win some money, but also we will enjoy in fantastic football games. This competition is the most popular when It comes to betting, and you shouldn’t miss to check pre-match betting odds and to place your bets. World Cup 2018 begins on June 14 with match at Luzhniki Stadium in Moscow when host Russia takes on Saudi Arabia. The final is set for Sunday July 15 on the same stadium as the opening game. Right now you can bet on the World Cup winner and betting odds are very high. With our football betting tips you can prepare your own betting strategy or just place your bet and enjoy in good football. Five-time champions Brazil and defending champions Germany stay as favorites to lift this trophy, but for sure several nations also have great chances to do that. Argentina are another one bookmakers' favorites, as are previous World Cup winners Spain. France, Belgium and England are the teams who have great ambitions for this big championship. If you doubt who can win this trophy, you can try to bet on who can reach WC 2018 finals or WC 2018 semifinals. Defending champions Germany can become the first team to retain the title since 1962, but first they must focus on matches with Mexico, Sweden and South Korea. If you believe they are favorites in the Group F then can try to win some money with bet on Group F winner – Germany. Brazil are in the Group with Switzerland, Serbia and Costa Rica and they are big favorites to win this group. England have been handed a favorable group alongside Belgium, Tunisia and debutants Panama. The Three Lions are highly motivated for this competition and maybe they finally can do something on major tournament. If you like to bet without many risk then the best option is to place bet on team who can qualify for the knockout stage. Higher betting odds are on teams who are not favorites for the first place in group. You can try with Serbia, Sweden, Poland, Denmark and Croatia. Several players have great chances to win this title, but lots of factors will influence on that. One of the main favorites to win WC 2018 top goalscorer title are players who play in attack and who play in the teams with the highest chances to lift WC 2018 trophy. Neymar and Lionel Messi are players who have the highest chance to do that. But also players like Cristiano Ronaldo, Romelu Lukaku, Harry Kane and Sergio Aguero play very well this season and they can do a lot on World Cup 2018. ← Previous Post Free Betting Tips 05.02.2018. Next Post →Vip Tips 06.02.2018.